The Secretary to the Government of the Federation, Boss Mustapha, has stated that the long-standing relationship between Nigeria and the United Kingdom which spanned over decades be sustained and cemented. 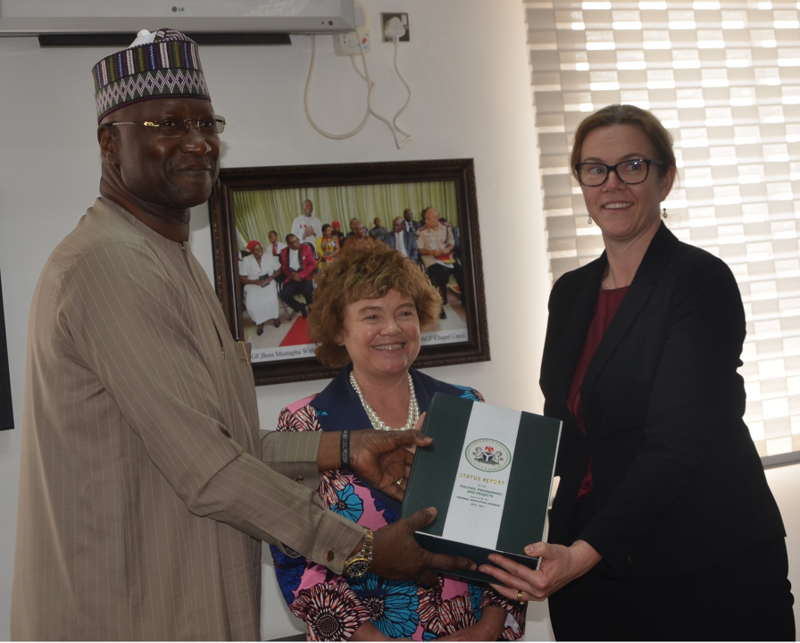 The Secretary to the Government of the Federation, Boss Mustapha, made this known when the Director for Africa, Foreign and Commonwealth Office, United Kingdom, Her Excellency, Harriet Mathews, paid him a courtesy call in his office recently. According to SGF, the visit of the British delegation in Nigeria further strengthens the bond between the two countries. He recalled that Nigeria as a former colony of the British colonial rule has enjoyed collaborative efforts and support, hence the need to keep the ties. Mustapha thanked the British Government for the congratulatory message on the re-election of President Muhammadu Buhari for the second term in office. He said the first tenure of the Buhari led federal government scorecard witnessed tremendous achievements: the degrading of insurgency in the North East which hitherto, the Boko Haram insurgents ceased 17 local government areas under their control; the success story on the anti-corruption crusade with huge recovery and the government’s economic policy of diversification through agriculture. The SGF stated that through the diversification of economy through agricultural programmes, Nigeria has been rated as one of the major producers of rice in Africa adding that, with the population of about 250 million, Nigeria believes in contributing directly to investment globally. “No country can grow economy alone without the collaboration of other countries”, he averred. He however solicited for support from the United Kingdom in the key areas of Capacity building, provision of hardware, the empowerment of the IDPs, the repatriation of stolen funds stashed away in foreign banks and institutional capacity to enable Nigeria’s institutions fight corruption effectively. Earlier in her remark, the Director for Africa, Foreign and Commonwealth Office, Mrs. Harriet Mathews, congratulated President Muhammadu Buhari for coming victoriously in the 2019 general election. She revealed that the North East is of much concern to her and the Commission is poised to offer humanitarian services to the Internally Displaced Persons (IDPs). She said Foreign and Commonwealth Office is a department of the government of the United Kingdom with the core mandate of protecting and promoting British interests worldwide. Also speaking, the British High Commissioner to Nigeria, Her Excellency, Ms. Catriona Laing promised to continue to sustain the existing bilateral relations with Nigeria.